What is Tasker for Android? I remember when I first started using Android, there was all this talk of automating what you can do on your phone using an app called Tasker. I was new to all this so it really intrigued me as previously I’d used Symbian and had time contexts to establish a silent mode at work… But that was about it automation wise. So what else did Tasker offer? Well I read a few reviews and decided I’d give it a shot. “Total Automation, from settings to SMS. ADC2 finalist! Basically speaking, you can act on any type of single or multiple contexts (triggers) such as your location, connection to WiFi or Bluetooth device, opening an app, time/day, email or text received etc… There are too many to list. Based on these triggers you can then create a task list of what you want your phone to do when this profile becomes active. A simple and popular example would be something like when at work (triggered by connection to a particular WiFi AP or using Tasker’s own location map service) then turn silent mode on and Bluetooth off. When exiting the work location re-enable sounds and turn BT on for connection to a car handsfree. As you can see in green my ‘Work’ profile is enabled and I have expanded this view so you can see the contexts used (%Car is a user variable which will be covered in a later post, but is basically saying if I’m not in my car. The AutoLocation context is a plugin from the AutoApps range of plugins for Tasker from a developer called Joao. However Tasker has a built in function to create locations). 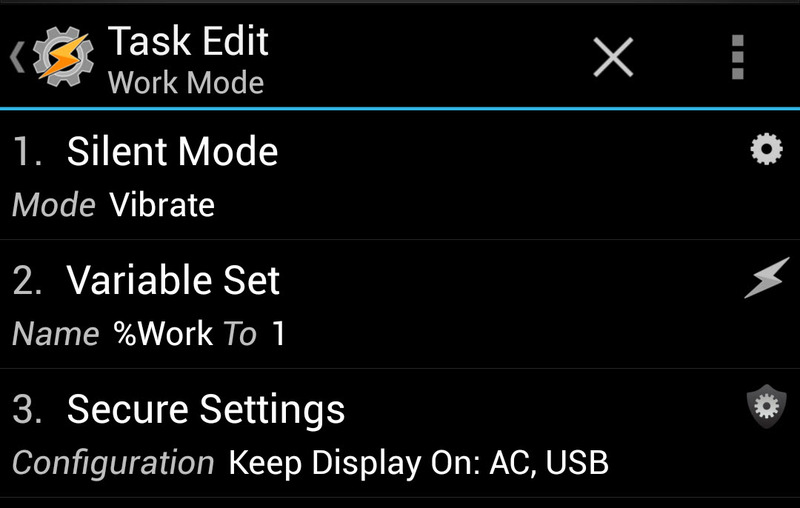 In effect what I’m saying is when I’m not in the car and I’m in the region of my work I want Silent Mode to be enabled, a user variable of %Work to be set to 1 (I can then use this to ensure tasks or profiles do not get triggered whilst at work i.e. a time based profile which would override my work profile) and finally the screen to remain on when charging (I put my phone in a dock). This is quite a basic setup, but one that is very useful to have. Tasker can be found from the Play Store. There is also a 7 day free trial version available direct from the Tasker website. 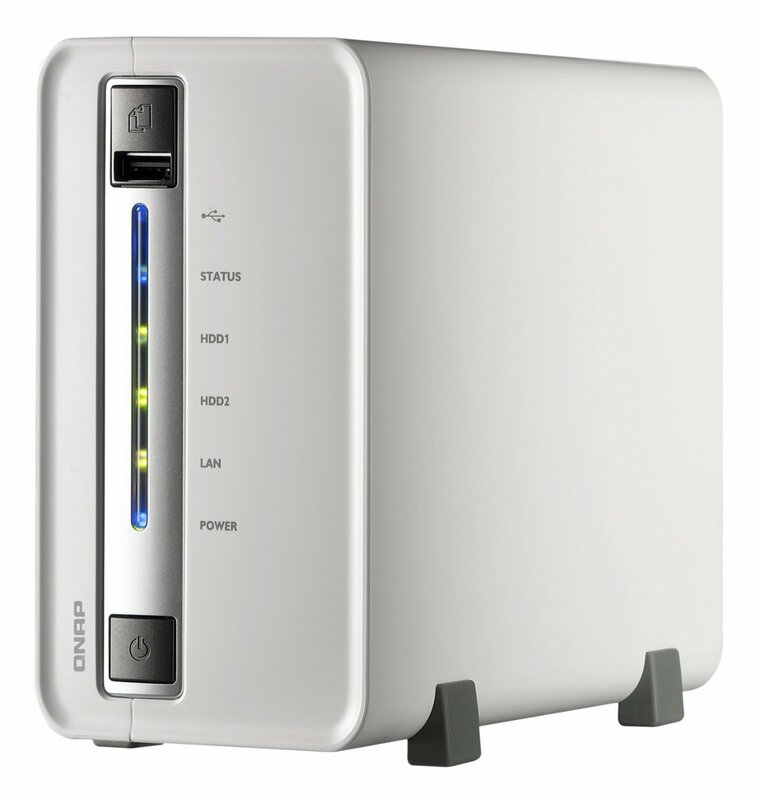 I love it, this NAS forms the base of my Home Media/Networking setup. All my files, media, programs etc are all saved on here with individual access for each user. There are so many benefits that I can’t go into them all, however would highly recommend this to anyone looking for a NAS to build a home network. The only thing for me is the CPU & RAM are a little low, but then I guess you get what you pay for and higher specced models are a big jump up. 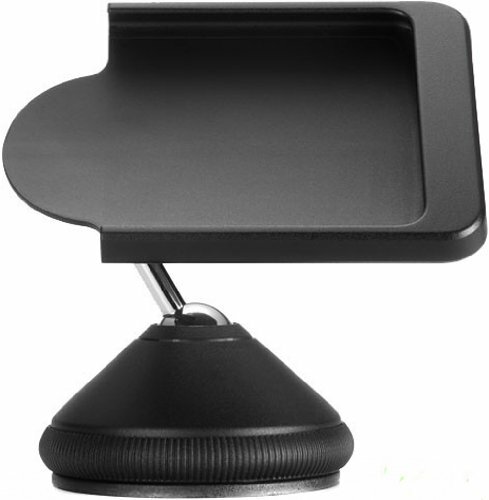 This is perfect for light to moderate usage and streaming media over a wireless N network. First off, I’m not a gamer. However I have Anker products and this is a brand I trust, so getting this mouse as a replacement to my ‘dumb’ mouse was really an easy decision and I would recommend this to anyone. While slightly larger than my old mouse it fits perfectly into the palm of my hand. The grip point by the thumb is a nice addition to ensure your thumb sits nicely in the right spot with the customisable buttons neatly resting above (the middle button above the thumb also has some ridges to help easily identify which button is which without looking). The mouse glides well over any surface and doesn’t seem to collect grime on the pads as easily as my old mouse. As mentioned in TdHD’s review the Anker logo light is completely customisable to be off or have different breathing speeds and colours. The other lights can only change colour (scroll wheel & DPI lights). While the mouse to me was a little light, the addition of a few supplied weights helped tailor this mouse to be just right for me which is a welcome option. Overall a well built, well designed quality mouse which has already raised a few glances and comments in my office. As mentioned, I am not a PC gamer… But, I do use a PC a lot for Spreadsheets, VBA, all sorts of other stuff. Sometimes I demonstrate what I am doing and it’s not easy to have the keyboard at hand. By changing the defaults of some of the button clicks I now have direct access to all of my needed tasks directly by my hand, i.e. highlight the text, click a button on the mouse – text is copied. Click a cell somewhere else, click another button – pasted. Fantastic! While I have no real use for the macro record button (hence why I changed the behaviour) I can see that this would be an excellent option for gamers to easily record a melee attack or any other multi-key stroke behaviour which could give an upper-hand in a game. Installation was a simple plug and play, then off to the ianker website to download the latest drivers in order to customise the mouse. Once installed it’s very intuitive to navigate and select what you want to change. Ideal users – Obviously gamers. But I will add that anyone who uses keyboard shortcuts, precision software (i.e. photoshop for fine editing thanks to the higher DPI) or just anyone who wants to stand out a little more with a funky mouse sat on their desk will benefit from the features on offer with this mouse. Also of note is that you can have 2 different profiles, so whilst it’s not a quick fix to change the weight of the mouse it’s simple to setup a profile for 2 people who use a computer and each have your own personal settings configured. Another option would be to say have one profile setup for Windows general (copy, paste, windows button etc.) and another profile for Photoshop with buttons set for shortcuts to certain tasks (or for gamers, a Windows profile, and a WoW etc. profile). Overall for the price this is on offer for I really don’t think you could get much better… Even if you don’t need the higher DPI rate (which other mice in this class are much more expensive), it’s a useful ability to have. Especially with the toggle button to quickly go between 4 customisable made variables. 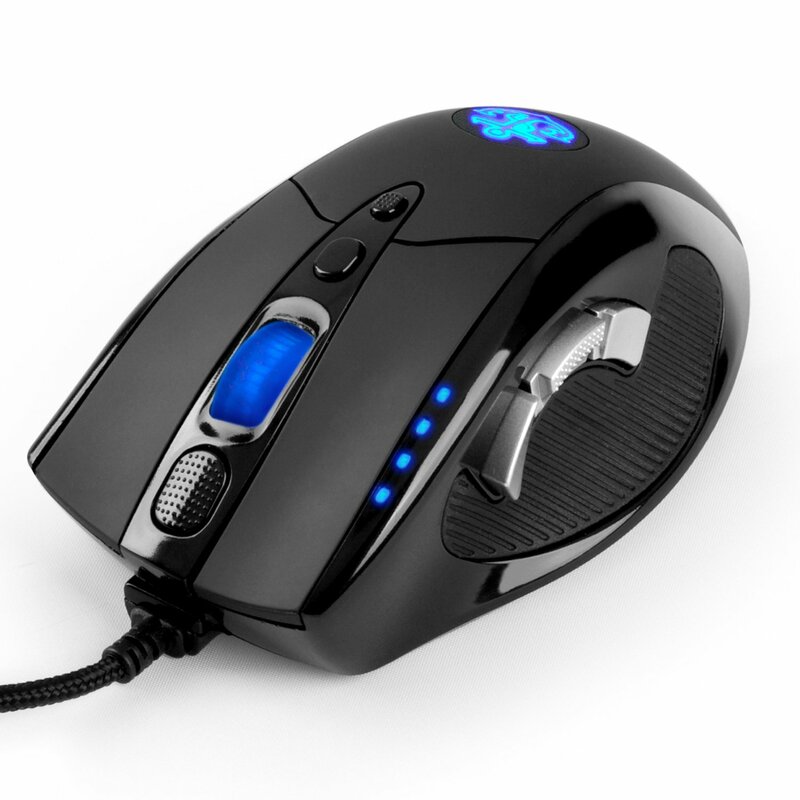 I’ve used the word customisable a lot in this review, and this mouse is exactly that. With the ability to change the weight, lighting, button press functions, DPI, scroll speed/acceleration it really means you can do what you want,when you want. Kudos to Anker for the quality of the product in a price range that needs no second-thought on purchasing. Seriously, if you are reading this then you must be interested in the product (or looking for a mouse of sorts). You won’t find anything better in it’s class and I would suggest the ‘Buy now’ or ‘Add to basket’ button should be the next one you click. OK, so I have an older laptop (must be about 6 years old now). 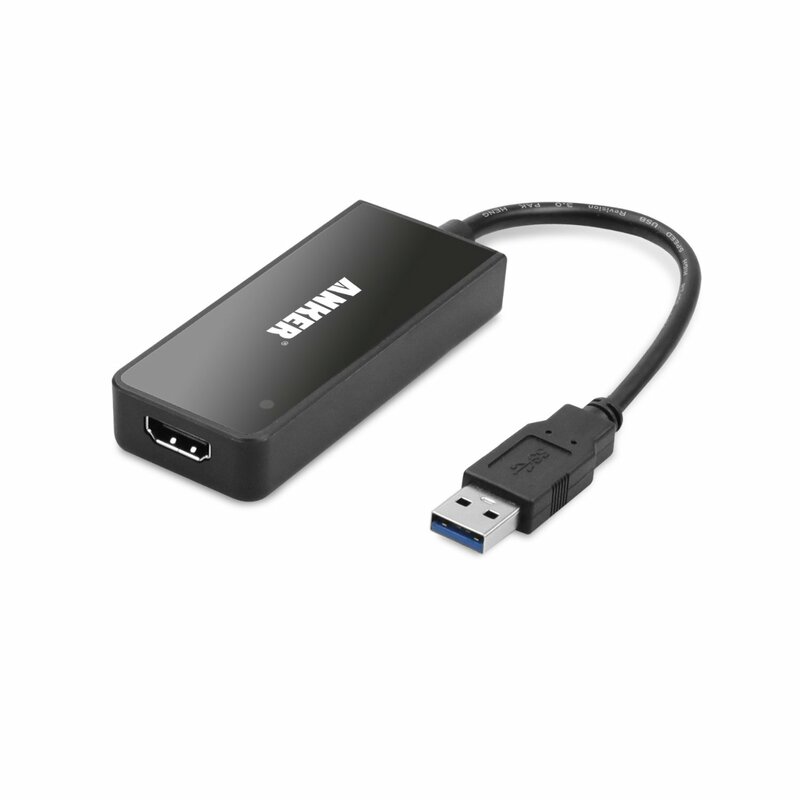 As such I do not have HDMI out or DVI Out, if I want to connect to the TV I have to use VGA…. But my TV doesn’t support an audio-in as well as VGA. Problem! So while I don’t need to connect the Laptop to the the TV regularly, Media streaming is accomplished through a NAS and X-Box360 combo. It is still handy to be able to connect the laptop for watching videos with encoders that cannot be played through the X-Box directly such as mkv. All you need to do is visit the DisplayLink website to download the latest drivers (I decided to just do this direct and not use the pre-packed driver disc to ensure I was running the latest from the start). Once done, plug the device in and let the drivers install, then I plugged it into the TV a violla. Perfect picture and sound on my TV either as an extension to my homescreen or as a duplicate. I could not be happier, it was so easy to do and the adapter in itself is not huge to become an annoyance if taking it away with you. The added DVI adapter would come in use for those with HDMI ports already taken up on your TV and do not want to unplug, or want to permanently set your PC to the TV as you can just use DVI port instead of HDMI for not much sacrifice in quality. The only negative I could have for this (and this is more a personal issue) is the length of the USB cable could be a little longer for me to save pulling the pre-existing HDMI cable a bit more out from the cable tidy. But this is really my own issue, so is not impacted on my score for the product. Nice product, well thought-out and excellent quality as always. Thanks Anker! I got this product and have to say that it’s great for a low-cost Home Automation setup. The availability of receiver products is quite wide, although not many are offered through the Amazon website. There are lots of websites which offer receivers such as plugs, light switches/dimmers, temperature sensors, door locks etc. 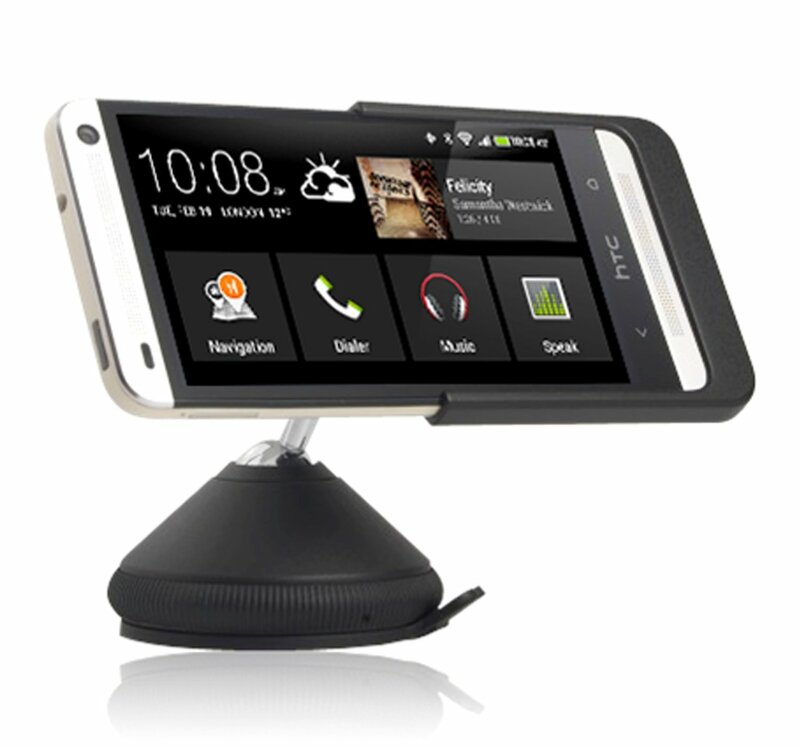 The benefit of the net is it works with X10, HomeEasy, Nexa and lots of other products using the 433Mhz frequency. All of which can be controlled from anywhere in the world using the Telldus.Live website or Smartphone apps which are built using the API. iPhone users have an official app available, while for Android I recommend the third party app: RemoteStick. You can also easily schedule devices to turn on/off so for instance you can set your Kettle/Coffee machine up the night before and time it to come on before you wake. Or Save power by plugging things like TV’s into a switch so that at night it’s completely shut off instead of in standby. As for the device; The main unit is small and plugs into your router via an ethernet cable (supplied). Power to the unit is supplied through USB either directly from a socket, or if your router has a USB you can power it from this also (again, relevant cables/plugs provided). My BT HomeHub3 has a USB and this is used to power the transmitter directly. Once plugged in, you need to go to the Telldus.Live website to authorise the device (all communication goes through the Telldus web servers, this is one of the only downsides to the Tellstick-NET as if you lose Internet connectivity in your home or the servers go down then you cannot control any receiver units until communication is restored). I believe this is something the developers are looking at to see if they can achieve local transmission. Once done you are good to start adding receiver devices to your home. I initially had 3 plug sockets from Nexa and an Wireless Temperature Sensor THN132N to setup. The Temp sensor just needed batteries and to be placed, the Tellstick picked this up straight away and started receiving readings. The Nexa plugs I placed 1 on our Kettle plug, 1 on the multi-adapter for the TV/Entertainment setup and the last in the bedroom for things like hair straighteners etc to be plugged into (reason for this is so that if my wife leaves the house and is unsure if she unplugged them, we can just use an app on our phones to remotely turn the switch off – Or if you have Android, you can use a combination of the apps Tasker, AutoRemote & RemoteStick to automatically turn off any plugs when everyone is out the house. Which is what I have done). The Nexa units again were easy to add to the Tellstick Live account. And all in all setup took about half an hour. I have since added a HomeEasy light dimmer to our bedroom so that I can a.) Turn off the lights in the bedroom without getting out of bed. And, b.) In the morning I have the lights start to dim up in stages starting from about half an hour before my phone alarm is due to go off. Mimicking sunrise to try and make waking up in the morning easier. 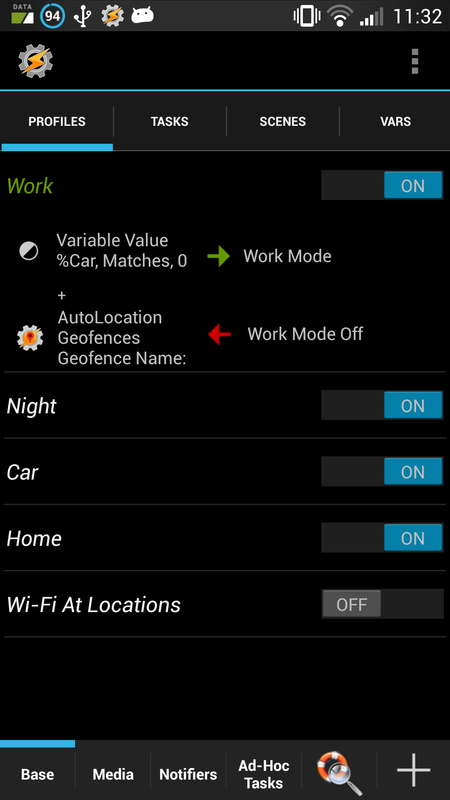 This is quite an advanced scheme, again using Android apps Tasker, RemoteStick and AutoAlarm. Another setup I had at Christmas time was to turn the Christmas Tree lights on when we were at home, and as soon as we left (i.e. both mine and my wifes phones disconnected from the Wi-Fi) or my tasker night profile became active the lights would turn off. Some of the setups I have are a bit more advanced. However if you are looking to start low-cost Home Automation it is easy to install the tellstick and some plug switches so that you can easily control devices from your phone or while out of the home using smartphone apps or the Telldus.Live website. I would highly recommend anyone consider this as a good option for starting in Home Automation as there are a good range of compatible devices (you can see what on the Telldus website) and these devices are relatively cheap. A set of 3 Nexa plugs come in at around £15. I love this and am looking at ways of further extending what I can do with it including Heating Control, motion sensors, door opening sensors etc.